Want to upgrade your fuel lines? Run twin turbos but need that hard to find oil line? 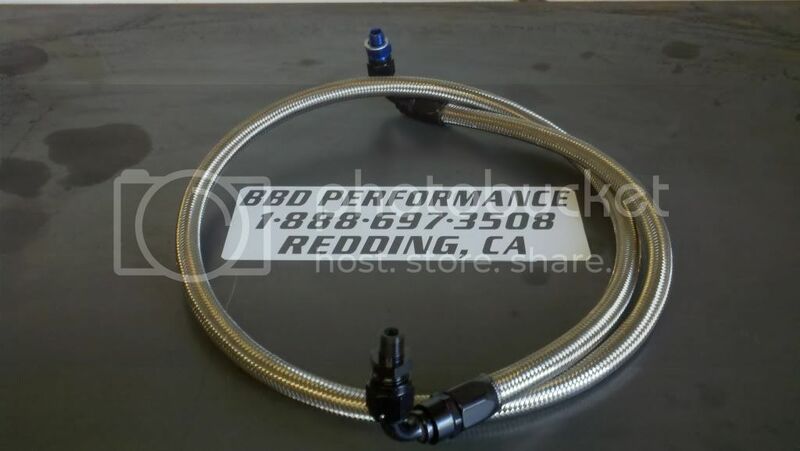 Or maybe just want to run some sweet looking stainless hoses with Red, Blue, or Black fittings! Then you need to call BBD Performance today! We are now stocking all the popular fittings for Ford, Chevy, and Dodge! We also have the hard to find High PSI BLACK stainless braided! Adapters, 90*, 45*, 90* Street, Banjo, SAE, JIC, if it can be screwed together we can do it! All Hoses are made In-House! 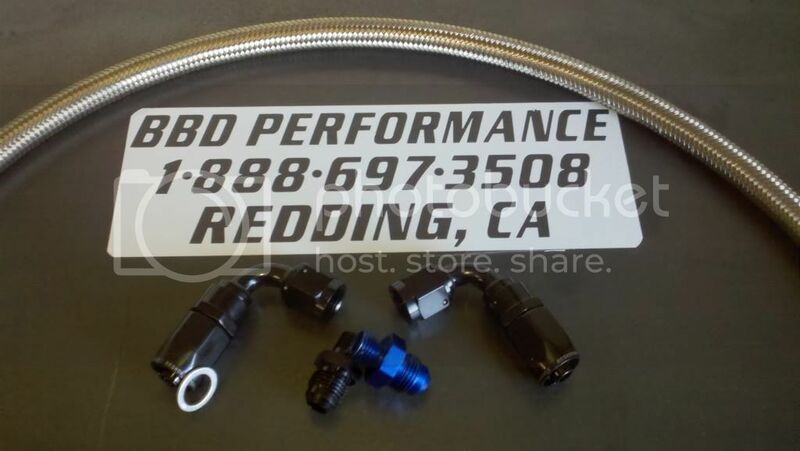 BBD can provide you with a full hose or parts to build your own! And as always if you find it cheaper let us know, we will not be beat! What would an oil line cost to go from the 12v's factory oil port to an HE341 mounted in a twin turbo configuration? How long are you needing them to be and do you want to go with any 90's like in the above pics or just straight? Can I get a price for a 90* 1/2 push lock fitting, thread size m18x1.5 and just a standard straight push lock 1/2 inch, thread size m14x1.5, and a 90* bulk head fitting? Also could I get a price on 20ft of 1/2inch fuel hose? You have a chance to put together a quote yet? I would like to run a 1\2" line from my fass to a dual feed at the pump and i don't know the sizes for the fittings or lengths. would you happen to know these? And a price for it too? soon as i pull my motor i will for sure be giving you guys a call! !